Looking back, can you still remember how you envisioned your dream home? We’re sure you’ve listed tree houses, castles, and fairy tale cottages as some of your pegs. Fast forward to 2017—with the rise of DIY solutions, pretty restaurants, and homey cafes—are you still wishing for something as magical? 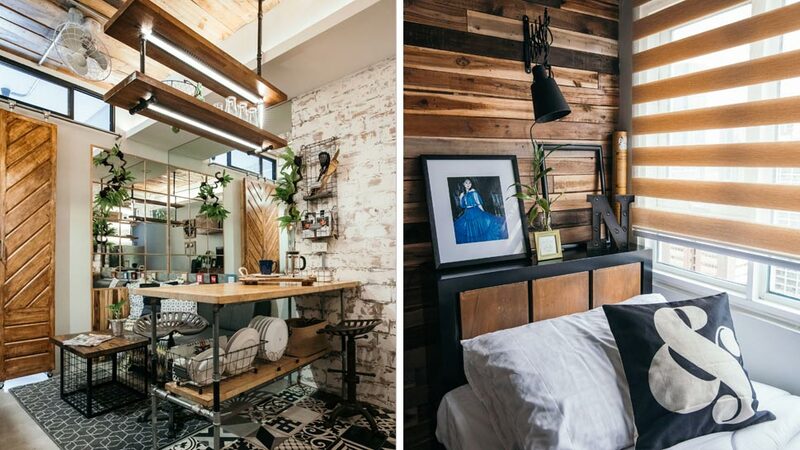 If the charming combination of wood, metal, and bricks tickles your fancy, this college student’s compact home in Pasig will definitely inspire you to revisit your dream home checklist. Since the family is based in Iloilo, the client wanted to create a space where her daughter can feel at ease and comfortable even if she’s alone in the city. Taking inspiration from the inputs and DIY projects of the client, interior designers Pam Laserna and Joan Reyes of LAHUBRE Designs came up with an overall look that showcases textures, patterns, envy-worthy details, and furniture pieces that the client designed and made with the help of a go-to carpenter in her home province. Working on a tight space was challenging, but Pam and Joan had the support of the client and her godson. This special teamwork made last-minute changes a breeze and achieving the rustic-industrial look easier. At the end of the renovation period, the design team and the client weren’t the only ones satisfied with the output. The young occupant was happy to move in—it’s not only a short walk from school, it also has everything she wants in a space.